As the government of Pakistan prepares to launch into what many expect will be a multi-decade long infrastructure spending spree, cement manufacturing companies are preparing to meet that demand and heavily investing in their cement production capacity. Power Cement wants to make sure that it does not get left behind in the race to serve that explosion in demand from both the government and the private sector. 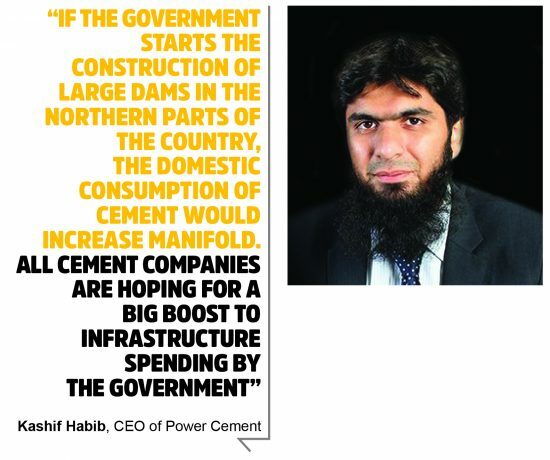 “The Power Cement plant will start production on full capacity in June 2019 and it will produce 7,700 tons per day of clinker and 9,600 tons per day of cement,” said Kashif Habib, CEO of Power Cement, the company previously known as Al-Abbas Cement until its acquisition by the Arif Habib Group, a financial and industrial conglomerate, in 2010. The company was founded in 1981 and operates its cement plant in Nooriabad, about 135 kilometres from Karachi. The company currently relies on selling its cement to private sector real estate developers in Karachi, Hyderabad, Thatta, Kotri, and other cities in Sindh. 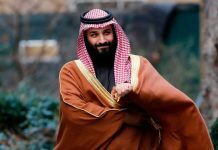 Its biggest customers include the Defence Housing Authority (DHA), the military-owned real estate developer, and Bahria Town, Pakistan’s largest private sector real estate development company. The plant’s proximity to the ports in Karachi and Port Qasim allow Power Cement to export its product to the Gulf Arab countries and other parts of the world as well. The cement sector has been heavily dependent on local demand for growth over the past decade. 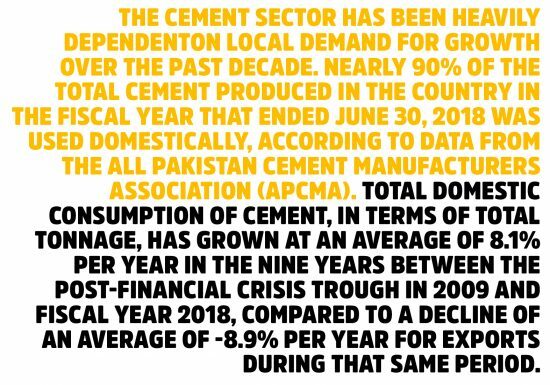 Nearly 90% of the total cement produced in the country in the fiscal year that ended June 30, 2018, was used domestically, according to data from the All Pakistan Cement Manufacturers Association (APCMA). Total domestic consumption of cement, in terms of total tonnage, has grown at an average of 8.1% per year in the nine years between the post-financial crisis trough in 2009 and fiscal year 2018, compared to a decline of an average of -8.9% per year for exports during that same period. However, for plants located in the southern part of Pakistan, there are concerns that the domestic demand engine may be slowing down even as exports fail to pick up pace. In 2017, for instance, the Supreme Court of Pakistan ruled that the maximum height for buildings in Karachi could only go to six stories owing to the municipal government’s inability to provide adequate water and sanitation infrastructure to buildings that were higher than that. The fears of a slowdown are not just theoretical. Cement companies have still been able to sell much of the cement they have produced, but only after significantly lowering the price. For the first nine months of the fiscal year ending June 30, 2018, Power Cement saw its cement dispatches increase by 3% to 504,000 tons, but revenue during that same period declined by 0.5%, which in turn cause net profits to go down by 10.9% during that period. Nonetheless, while cement company CEOs hope to see a pick-up in government spending on infrastructure, they are also realistic about the prospects of such an increase, given the fact that the government will be forced by austerity measures imposed by the International Monetary Fund (IMF) to cut spending, and much of that spending decrease is likely to be extracted from the development budget. As a result, Habib is pinning his hopes on being able to export cement from Pakistan, though on that front, he believes he could use a little bit of government help. “Cement factories are paying 30% of the cost of cement in sales tax, federal excise duty, and customs duties. These huge taxes make us uncompetitive in the international markets,” he said. 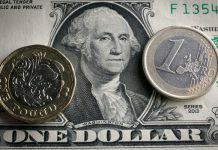 This is at a time when the price of coal, a key fuel source for cement production, has gone up, while the government has announced an increase in the prices it will allow state-owned gas companies to charge industrial consumers of Liquefied Natural Gas (LNG), the key alternative to coal for cement companies. “The federal government should give rebates to cement exporters if it really wants to enhance exports,” said Habib. “The cost of production of cement is much higher compared to the international market,” he claimed. “We can export clinker to other South Asian countries since the cost of clinker is higher in other parts of South Asia compared to Pakistan,” he said. The reason behind rising clinker prices in the international market is the decision by the Chinese government to shut down small cement manufacturing units which were not compliant with its new environmental laws. These small cement plants were exporting clinker to Bangladesh, which can now no longer access that supply. Bangladesh’s second biggest supplier was Vietnam, but given its proximity to China, Vietnamese producers are selling clinker to China to meet its demand after those plant closures. That has opened up an opportunity for Pakistan companies to begin exporting clinker to Bangladesh. “Most of the Pakistani companies exporting clinker to Bangladesh are doing so via the sea route,” said Habib. The demand for clinker in Bangladesh has gone up and its prices have also gone up from $32 to $36, he added. Among the companies exporting to Bangladesh are Lucky Cement, Attock Cement, and D.G Khan Cement. “It’s a good breathing space for Pakistani cement manufacturers to export our surplus clinker to Bangladesh and other parts of the world,” Habib said. “We are also exporting cement to India, Sri Lanka, Bangladesh, Afghanistan, African countries and some other small countries. Cement exports to India and Afghanistan is via road and ships. The monthly export of cement to India is around 70-75,000 tons,” he claimed. The cement plants located in northern part of the country have road access for exporting cement to India and Afghanistan, but if the plants from southern areas will try to export, it would be out of their price range owing to the low-profit-margin, he claimed. According to a rough estimate, 45,000 to 50,000 tons per day cement is being smuggled into Pakistan through the Iran border. The government is doing nothing to control the smuggling in Balochistan, he claimed. Power Cement, Attock Cement, Lucky Cement, DG Cement, Pioneer Cement, Bestway Cement, Cherat Cement, Gharibwal Cement and Maple Leaf Cement are in expansion mode in Pakistan as local consumption and exports are increasing. Total demand for cement in fiscal 2018 was 41 million tons in the domestic market. In addition, the industry exported a total 4.75 million tons. Total installed cement production capacity in Pakistan is 49.4 million tons, thus bringing the industry’s capacity utilization to 92.8% in fiscal 2018. With financing from both local and foreign loans, Power Cement has built an integrated plant with clinker capacity of 7,700 tons per day and cement capacity of 9,600 tons per day or 3.4 million tons per year. Habib said that if the government were to increase infrastructure spending, local cement producers will, instead of exporting, sell their cement in local markets as the margin on cement in local markets is much higher compared to exports. Power Cement Limited markets and sells its Black Bull Cement, Blue Star Cement, and Estate Cement brand in Pakistan. Its product portfolio includes ordinary Portland Cement, Sulphate Resistant Cement, Portland Blast Furnace Slag Cement, and Grounded Granulated Blast Furnace Slag. The Arif Habib Corporation, the parent company of Power Cement, recently invested an additional $11 million into the company. According to a notification sent to the Pakistan Stock Exchange (PSX), Power Cement is exploring the possibility of installing components/machinery which shall make its plant energy efficient and is currently in negotiations with potential suppliers to finalize the agreement on a deferred payment basis. This guarantee amount by Arif Habib Limited, will enable Power Cement Limited (PCL) to negotiate a better deal with the potential supplier as AHCL shall guarantee the deferred payment to support the functionality, operations and growth of the associated undertaking, i.e. Power Cement Limited and will thereby earn commission on its non-funded exposure. The decision would be made via a Special Resolution at an Extraordinary General Meeting of Arif Habib Corporation Limited, which was held on September 26, 2018. Earlier, the PCL was obtaining foreign financing worth 30 million Euros from Deutsche Investors for its ongoing expansion project of 7,700 TPD clinker productions. This amount of 30,000,000 Euro’s being obtained by PCL would cover loan principal amount of Euro 15 million including borrowing cost and all other charges to be accrued during the tenor of the loan. “All investment has been made in the form of funds, which are utilized for purchasing of machineries doing civil work etc,” one of the top officials at Power Cement said. 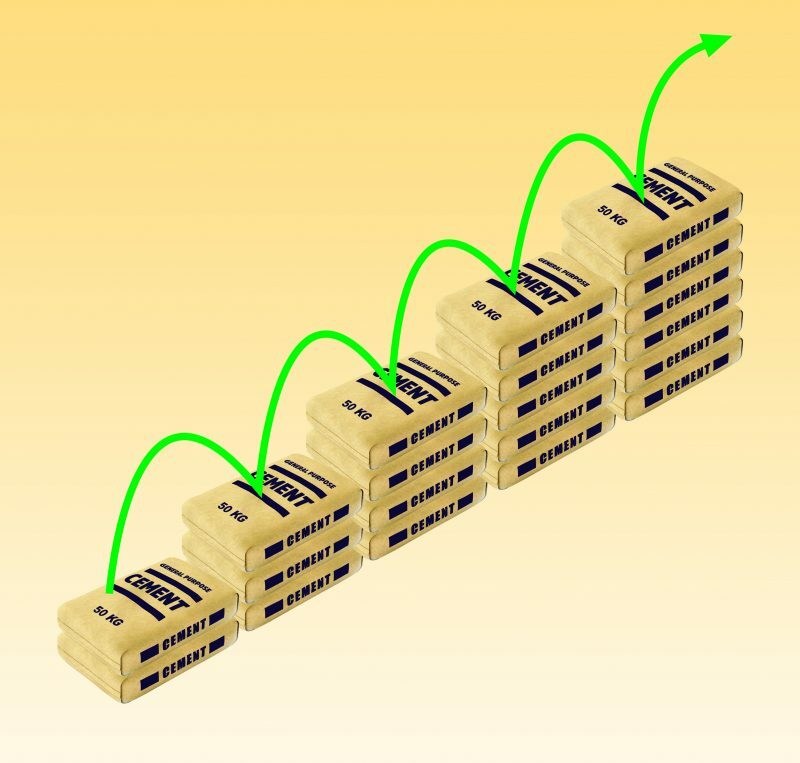 Other than equity, local investment includes Rs 12.1 billion, financed by the National Bank of Pakistan (NBP), Habib Bank Ltd (HBL), Faisal Bank Limited (FBL), The Bank of Punjab (BoP), Al Baraka Pakistan Ltd, Bank Alfalah, Dubai Islamic Bank (DIB), Askari Bank, First Oman Investment Co, and the First Credit and Investment Pakistan Ltd.
Investment worth Rs 4.1 billion is being financed by overseas organisations, including the Islamic Corporation for the Development of the Private Sector (Saudi Arabia), OFID, OPEC Fund for International Development (Austria) and DEG – Deutsche Investors. Equipment is being supplied by FLSmidth Europe while TEPC China is working as the construction contractor. 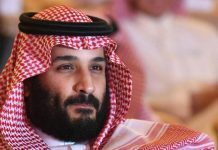 Next articleAlibaba vs Tencent in Pakistan?